Announcing first edition of 750 copies published in hard cover by Sagamore Press. Bi-lingual monograph of 48 quad-tone black and white images . 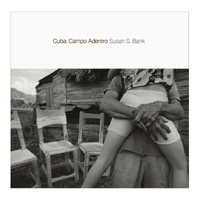 Preface by Susan S. Bank and essay by esteemed Cuban art critic, Juan Antonio Molina Cuesta. A poetic portrait of an -out-of-the-way agricultural community in Pinar del Rio Province where Bank lived and worked for more than 6 years. What began in 2002 as a weekend retreat from the hustle of Havana, became an intense personal project for Bank, who returned again and again to work with ten families who live without benefit of modern conveniences. Overcoming obstacles from both the US and Cuba, with her Leica camera, she has taken the raw, simple details of el campo and created an intimate and deep portrait of the daily life of campesinos. This is the first known monograph that deals exclusive with ordinary life of farmers in contemporary Cuba. Robert Frank: "Extraordinary. . . full of life!" Lesley Martin of Aperture : "Campo Adentro is filled with lush, classic luminosity."